A quiet bakery that serves nice breakfast, Chayya Cafe is a favourite with locals who wants to avoid crowds. Drop by for a bagel, stay for the views and then, pack a cinnamon roll for the road… Your road trip will be a happy one. 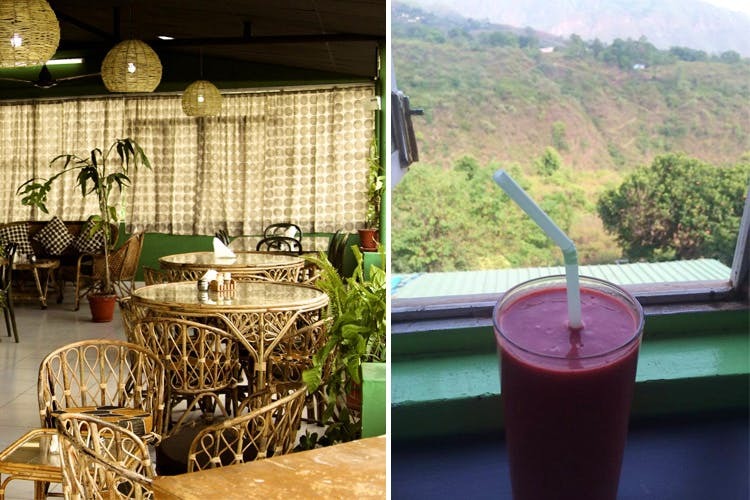 There’s something about feeling the mountain breeze in your hair as you eat a stack of pancakes and, luckily for us, this little cafe has both. They start serving brekkie at 9:30am, and have a menu that covers the usual suspects (like omelettes along with poori bhaaji). You might not be a morning person and may not make it in time (love you, pillow) for their brekkie, but no one can stop you from grabbing a cappuccino – or a blueberry mojito – with both hands and getting your groove on in the evening. If you’re really homesick, order paneer tikka masala, aloo jeera and roti. If we were to put in our two cents, we’d say, grab the seat under the painted tree (it’s right by the window) and pick up a book to revel in some ‘me’-time. Remember to pack a loaf of their freshly baked breads, or some of their guava chutney for back home. P.S. A couple of weeks ago, they even hosted a benefit gig celebrating folk music from around the world – there was harp and guitar, you guys! What more could you possibly want? We’re also glad that they’ve maintained mountain-type prices without pretending to be a hipster place that charges a premium on their fresh juices. To give you an idea, their chicken pakoras are priced around INR 150 while pancakes are INR 130. Much yay?